We had a winter storm move in Friday night and the temps today aren't expected to reach the teens. It's 10 ° right now, and the predicted high was for 12°. Tomorrow's predicted twenties will feel nice compared to this. And yet, we're thankful for the freeze, thankful for the snow because that means spring comes next, followed by summer, followed by . . . well, you know the routine. We should have good moisture in the ground for spring planting time. I'm assuming that. I don't plant things anymore. The day-to-day chore of keeping Twitchy, the sometimes water-deprived philodendron, alive is challenge enough. Today, because it is so cold, it's important to warm up from the inside, especially if you have to be outside. Now, one could stand over the heat register in their favorite comfy robe, with a cup of hot tea (or coffee if that's your preference) in one hand and a hot homemade cinnamon roll in another. I agree that's a great idea, but you cannot live on cinnamon rolls alone, and eventually your mug is going to run dry. I found another way to warm up from the inside. It was something new at Hy-Vee and I brought it home last week. Actually I brought several of them home. They were on sale. It is Stouffer's Creative Comforts Meatloaf with Sweet Chipotle Barbeque Sauce. The meal has a mild spiciness to it, and I wouldn't want the company to change that, even a little. But, well, I was compelled to change mine a little. I added a spoonful of my favorite sour cream to the meatloaf and corn. 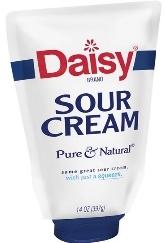 Now, this is real comfort food on a cold day and it took less than ten minutes to cook the meal, add the sour cream, and pour myself something to drink. I like this sort of fast food! The whole meal ended up costing less than $3.50. I didn't have to wait in a drive-thru line, I didn't have to check to be sure my order was correct. and the portion size is well-adjusted and didn't leave me feeling hungry or over-stuffed. So, it's a win-win. And, they're compact enough I can, if I choose, stuff the little freezer full of them. Stouffer's has a lot of delicious meals like the one mentioned above. Their lasagna, single and family size, is definitely worth making space for in the grocery cart. The mac and cheese is pretty delicious, too. So, if you're needing a meal that will warm you up from the inside but won't turn your grocery budget inside out, you might want to try these from time to time. 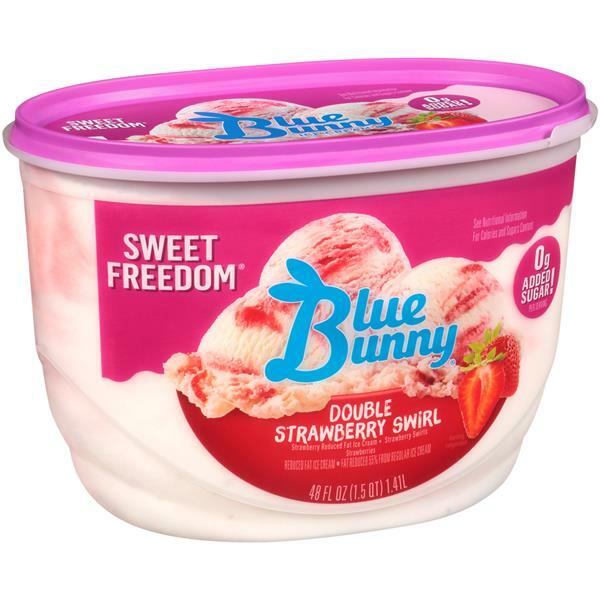 As soon as lunch is over with, I think I'll cool back down with some Blue Bunny Double Strawberry Swirl Sweet Freedom ice cream. Okay, so I go to temperature extremes. I'm just like that sometimes. Note: I am not an affiliate of these product makers nor of the retailers. Just passing on the info so you don't pass up a good thing.